Visualizing what the Emory University campus and Emory Village retail district looked like years ago is easier now that the university's Manuscript, Archives, and Rare Book Library (MARBL) has placed some of its archival photos of the campus and student life on Historypin.org. The website allows people to share historical photos and videos and collaborate with others. Since MARBL joined the site last November, its page has had more than 1,000 hits. Historypin uses Google Maps to pin each historical photo to its location on a present-day map. Site visitors can look at a map of the Emory campus and click on historical photos of locations all over campus from 1840 to the present. On MARBL’s Historypin page, an archival image of a couple on Mizell Bridge is shown overlaid on the modern-day image from Google Maps. Note the Emory quad, obscured today by the Carlos Museum, is visible in the background of the old photo. MARBL outreach archivist and research library fellow Matthew Strandmark explains that for MARBL, Historypin is a nontraditional social media platform to share the photographs in the Emory University Archives. Emory alumni are encouraged to pin their own photos of campus to MARBL’s Historypin page, he says. The Google Maps functionality not only gives visitors directions to the photo locations they want to see on the mobile app but also uses Google Maps Street View to line up historical photos with their modern locations. Users can overlay the historical photos with current views of the locations where they were taken. MARBL has received a lot of activity on Historypin since it joined six months ago. By mid-March, MARBL had already uploaded 46 photographs and garnered 1,151 profile views. Strandmark notes that institutions with profiles on Historypin for years have had around 4,000 profile views; in comparison, MARBL’s profile has gained popularity much more quickly than expected. 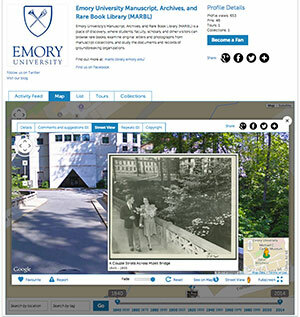 Strandmark and MARBL research fellow Anne Donlon are working on creating Emory’s own mobile application that will generate walking tours of campus from the archive’s historical photos. The app will employ the same technology used in the Battle of Atlanta website and application, an open web tour of Civil War sites in Atlanta created by Emory’s Center for Digital Scholarship. Users will be able to scroll through the photos and watch videos of people speaking about the sites depicted in the photos. The historical walking tour app is expected to launch in fall 2015.